The third preseason game typically has some degree of importance to it since teams are more apt to play their first team guys longer. But Thursday night’s preseason contest between the Jacksonville Jaguars and Carolina Panthers had some special significance to it. Cam Newton was going to see action for the first time since his surgery. Chad Henne was getting a chance to take the job from Blake Bortles in Jacksonville. So—yeah, while it was just a preseason contest, there was a little drama to go with it. It wasn’t must-see-tv type drama, but it was entertaining nonetheless. From that entertainment, there were a few things that stood out and are worth noting. Cam Newton played and survived. So much fuss has been made over his only drive of the game. With how some have talked about it, Cam looked like he was in MVP-form. It was ten plays, and only two were pass plays. He handed the ball off and got out of the way. Who cares? But his passes looked good, and he didn’t take off running! So what? Both plays were designed for him to get rid of the ball quickly and he did. He did his job—big whoop. When he has the time to scan the field, is forced to scramble, and then dumps the ball off to Christian McCaffrey in the flats instead of running—that will be impressive. All the talk has been about Christian McCaffrey, but don’t be surprised if Cameron Artis-Payne makes more of an impact in the run game this season. He has had a good preseason and did decent against the Jaguars (nine carries for 37 yards and two touchdowns). McCaffrey has shown he can run between the tackles, but he is not going to last if Panthers do that too much (think Reggie Bush). But between Payne and Jonathan Stewart, the Panthers look more than ready to have a great running game this year. “Coach [Ron] Rivera’s been talking to us all offseason about being physical, and we saw it out of the gate,” Panthers running back Jonathan Stewart said. “The offensive line controlled the line of scrimmage, and we go as far as they go. Carolina’s other prized draft pick— second round selection Curtis Samuel—finally played. He’s been dealing with hamstring issues for much of camp but was good enough to make his debut Thursday night. Now, he didn’t do anything when he was out there (three catches for nine yards; targeted five times). But he was out there (one step at a time). 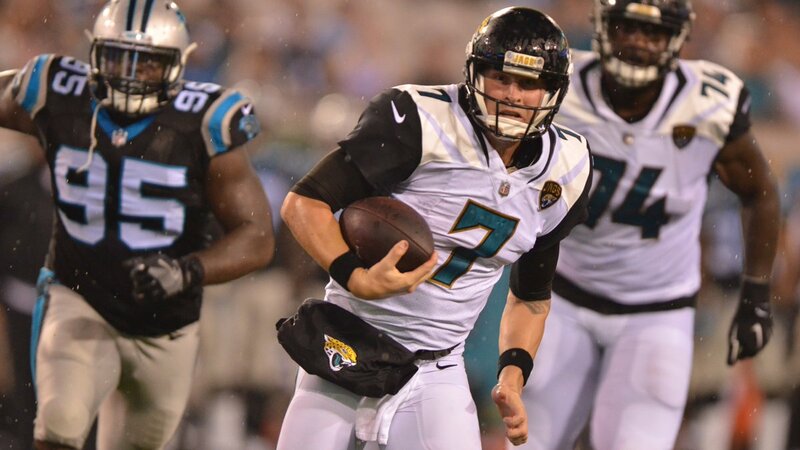 Chad Henne (8-14 for 73 yards; three sacks) had a chance to show he deserves to keep the starting QB job—and failed. There was really no difference between how the Jags offense looked with Henne than it has looked with Bortles. Henne had five drives—two three and outs (three total punts), a touchdown drive, and a field goal drive that was set up by an interception. Bortles didn’t really do much to earn the job back. He went three and out on his first drive, punted on his first two, and threw an interception on his third that set Carolina up three yards from the end zone. On a positive note, he was 12-16 for 125 yards and a touchdown. Yes, he led the team on two touchdown drives, but they were in the fourth quarter and against guys who will be looking for work in a week. 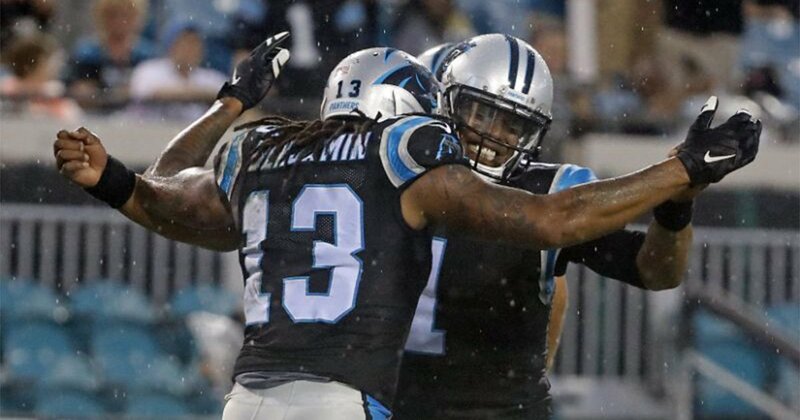 The second touchdown came late in the fourth quarter and made the score 24-23, Carolina. The Jags went for two but failed to convert. The final score ended up being 24-23, Panthers. When third-string quarterback Brandon Allen finally got into the game late in the fourth quarter, the crowd that was still present in Jacksonville went nuts! Jags head coach Doug Marrone has said he is not ready to name a starter, and who can blame him? He wants the guy who will make his team better, but neither guy looks like he is up to the task. So, do they give the No. 3 guy (Brandon Allen) a shot? Or do they bring in someone else? Carolina will close out the preseason against the Pittsburgh Steelers next Thursday with kickoff scheduled for 7:30 PM in Charlotte. The Jaguars will hope one of their quarterbacks stand out when they face the Falcons in Atlanta (also on Thursday; kickoff at 7 PM ET).